New for the 2018 line-up, the CVXDrive continuously variable transmission (CVT) from Case IH marks the latest advancement in a 60-year track record of innovations for Steiger tractors. The strongest CVT on the market is available in tractors from 370 to 540 horsepower — with up to 605 peak horsepower. And CVXDrive offers an all-new range of productivity enhancements with its smooth, seamless power transfer, continuously variable speed and easy shuttle operation, plus reduced fuel consumption in applications that require frequent use of roading and variable power demands. 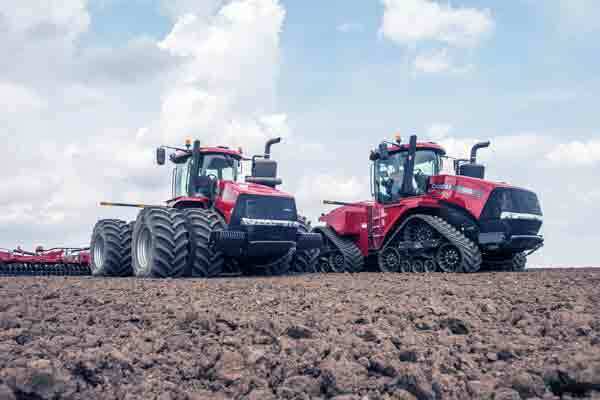 Available in 17 different configurations in Quadtrac, Rowtrac, wheeled and scraper options, producers now have a choice between the time-tested and efficient PowerDrive powershift transmission and the intelligent CVXDrive. The Steiger CVXDrive delivers seamless performance without breaking traction to the ground for applications including slurry hauling, tile plowing and scraper work. Operating the CVXDrive is as simple as setting it and forgetting it — easy-to-use controls let the operator dial in the desired speed and power transfer from 3 feet per minute to 25 mph. The new Steiger CVXDrive series tractor is available in 17 different configurations in Quadtrac, Rowtrac, wheeled and scraper options to meet individual operation needs. Putting the performance to work is easy for any range of operators, from novice to the experienced. The CVXDrive is operated with the same intuitive easy-to-use controls found in Case IH Magnum, Optum, Puma and Maxxum series tractors with continuously variable transmissions. The integrated split-throttle on the MultiControl Armrest lets operators focus on the application at hand, and it assures farm managers the tractor is running as efficiently as possible in every situation. Once the operator sets the desired speed, CVXDrive automatically selects the most efficient transmission range. The benefits translate to a range of traditional applications and extend beyond farming. The CVXDrive transmission produces greater precision and control over inputs, from planting to seeding to fertilizing to spraying. And the low-speed power generates increased performance and faster cycle times with reduced slippage for tile plow and scraper applications, as well as heavy-duty tillage. For uses beyond farming, like loose material handling, faster shuttle speed operation provides seamless forward and reverse movement to increase productivity and efficiency. •	Exclusive split-throttle controls on the MultiControl Armrest: allows the engine to optimize the fuel efficiency and response to the horsepower required to provide a relaxed operator experience. •	Uninterrupted power to the ground: operator is free to focus on the application at hand, improving performance. •	Exclusive three preset speed controls: switch seamlessly between three preset speeds with the click of a button — and program one of three presets to match the needs of the application at hand; simplify grain cart operations, scraper applications and hauling heavy loads. •	Accelerator pedal: able to control your speed more effectively, like in a pickup truck, when hooking up implements, packing/pushing loose material, loading and more. •	Active stop: holds the tractor stationary on any grade or slope when transporting or hauling. A series of design features deliver improved performance. The CVXDrive transmission was engineered specifically to fit into the rugged, heavy-duty Steiger frame and uses a simple compound planetary system featuring one input and two outputs. Four-range technology that effectively transfer power more efficiently throughout the tractor to the drawbar. And the CVXDrive is powered in Steiger tractors by electronically controlled Case IH engines from FPT Industrial. To reach 605 peak horsepower, the Steiger 540 CVXDrive is powered by a two-stage turbocharger engine. The whole system meets Tier 4 B/Final requirements with patented SCR-only emissions technology proven to deliver more power with less fuel for lower overall total cost of operation compared with competitive tractor offerings. •	The time-tested PowerDrive powershift transmission, which broke performance records in tests at the Nebraska Tractor Test Laboratory. The Steiger 620 wheeled tractor set records for drawbar fuel efficiency, drawbar horsepower and maximum pull. •	AFS AccuTurn technology — it takes the guesswork out of turning on headlands and helps you do a better job of tilling, fertilizing or planting while keeping you fresher through those long days in the field. •	The new pre-compression hydraulic pump, extra insulation throughout cab and brake pedal, and improved door seals, which make for a quieter, more comfortable ride. •	Brighter LED marker lights, which increase tractor visibility on the highway or side roads at dusk and night. •	And several other additions, including improved heavier 5.5-inch axle design, even more user-friendly HVAC controls, strengthened dual wheel hubs and more.